The author of Learned Optimism discusses what someone can and cannot change about his or herself and talks about developing the skills to change and the skills to cope. 75,000 first printing. $75,000 ad/promo. BOMC Alt. * Dieting down to your "ideal" weight will prolong your life. * Reliving childhood trauma can undo adult personality problems. * Psychoanalysis helps cure anxiety. If you think any of these statements are true, get rready for a shock. In the climate of self-improvement that has reigned for the last twenty years, misinformation about treatments for everything from alcohol abuse to sexual dysfunction has flourished. Those of us trying to change these conditions often experience the frustration of failure, mixed success, or success followed by a relapse. But have you ever asked yourself: can my condition really be changed? And if so, am I going about it in the most effective way? * The vital difference between overeating and being overweight, and why dieters always gain back the pounds they "lost"
Martin E. Seligman, Ph.D., is Kogod Professor and Director of Clinical Training in Psychology at the University of Pennsylvania. 6. 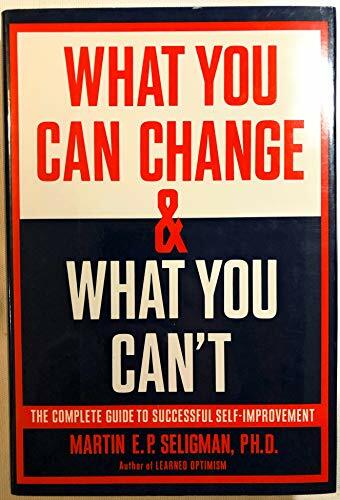 What You Can Change And What You Can't: The Complete Guide to Successful Self-Improvement Seligman, Martin E.